Now and then we get bug reports of test cases crashing on a specific configuration in an indeterminate manner or frequency, both from our own build bots as well as from our users. One of those I looked at recently involved a runtime test case on Linux/AMD64. The test would only crash infrequently, but luckily I could reproduce it in a VM. 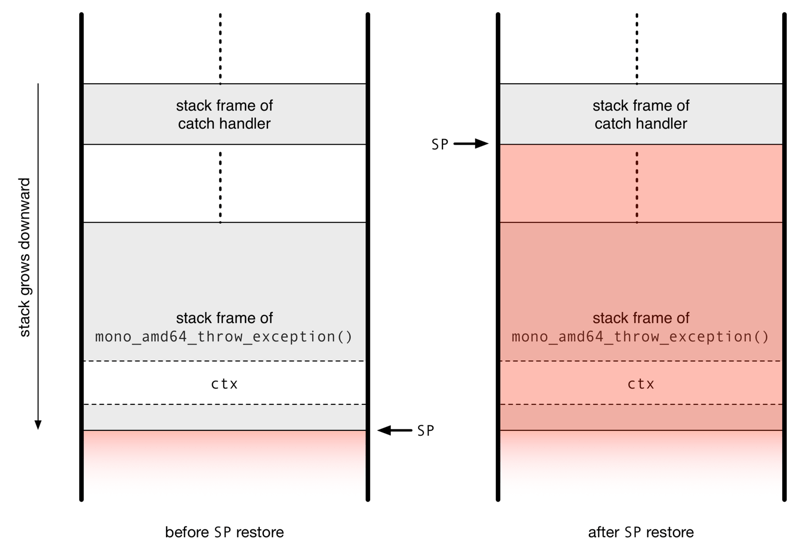 Mono generates null reference exceptions by just letting the code trigger a segmentation violation signal, which we catch in a signal handler that then proceeds to throw the NRE. This approach, as opposed to doing a null check whenever we access an object, is that there is no overhead at all in the case the reference is legit, and the code we generate is shorter. Garbage collection, on the other hand, also involves signals: stopping the world for a collection on Linux is done by sending a signal to each managed thread. Each thread catches its signal, which tells it that it has to suspend until the GC has done its work. When we look for the cause of a bug like this the first thing we try to do is catch the crash in a debugger, in this case GDB. Unfortunately, the crash was caused by a segmentation violation that our signal handler cannot handle (because it doesn’t occur in managed code), but a regular run of the program also triggers segmentation violations like crazy, so just breaking at each SIGSEGV didn’t get us anywhere. My first attempt at getting to the crashing SIGSEGV was to write an Expect script that drove GDB to the first SIGSEGV, presumably caused by the null reference in the managed code loop, remember the offending address and then keep continuing until it hit a SIGSEGV at a different address. Sadly (and quite typical of cases like this), running the code that way in GDB never succeeded in triggering the bug, so we had to think of other options. At first we thought the crash was caused by the interaction of the two signals (the segmentation violation from the null reference and the stop-the-world signal), but we looked into other hypotheses. We tried two different ways of getting rid of the segmentation violation: using explicit null checks to trigger NREs and just throwing an exception manually without accessing a null reference. Explicit null checks (enabled with the environment variable MONO_DEBUG=explicit-null-checks) makes the JIT emit less efficient and more elaborate null checks whenever an object is accessed, so an NRE can be thrown without going through a SIGSEGV. We figured it probably didn’t matter which type the exception was, and indeed it did not: both with explicit null checks as well as with the manual exception throw the crash still occurred. We also looked into whether invoking the garbage collector was critical to the crash, and it turned out it was: just making the other thread sleep instead of calling the GC made the crash go away. Also, despite what the bug report claims, the crash was not dependent on SGen—it occurred with the Boehm collector, as well. Armed with this new data we set out to finally get a close look at the crash in the debugger. Since the crash still only occurred very infrequently I brought my Expect script to bear again, and after a while we did get the crash in GDB. It did, regrettably, give us less information that we had hoped: instead of crashing somewhere in unmanaged code while dereferencing an invalid pointer, the crash resulted from the program counter being set to an invalid address, namely zero. There are three main ways of setting the program counter on AMD64: CALLing a function, RETurning from a function and JMPing to an address. Spending some time looking at the stack dump it seemed that the most likely cause was a jump, which did not make our job easier, since it leaves no trace of where it came from. This piece of code is executed as the last step of throwing an exception. It jumps to the catch handler, which involves first restoring a bunch of registers, including the stack pointer, and then doing the actual jump. We guessed that this jump to register r11 was the one that landed us at address zero. Observing in a few more crashes that r11 was indeed always zero corroborated that hypothesis. Note that the context—the data structure that contains all the values for the registers, including the program counter—is a local variable of this function, i.e., it resides in this function’s stack frame. Said stack frame is on the same stack as the catch handler that it eventually dispatches to, but further down, of course. We pass the address of the context to the above restore_context() function. It seemed obvious now that for whatever reason the value for the program counter was set to zero in the context, so we added an assertion to check for that directly before the call to restore_context(). The assertion never failed, but the program still crashed. Most ABIs specify that programs must assume that data below the stack pointer (plus the red zone) is subject to arbitrary change because it’s used by the operating system for invoking signal handlers, for example—exactly what happened in our case with the thread suspend signal. It’s somewhat embarrassing that we could already generate the correct code, but only did so in case we were running on Valgrind, because it gave us a warning about it that we apparently thought was a false positive. Looking at our code for x86, after fixing AMD64, we found that we had the same bug there, but nobody had reported it yet, probably because it was harder to trigger.